This entry was posted on April 5, 2012 at 9:45 AM and is filed under Pop Culture. You can follow any responses to this entry through the RSS 2.0 feed. You can leave a response, or trackback from your own site. 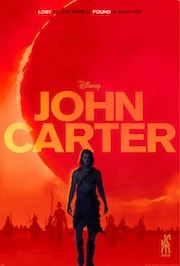 Think again, and check your sources – worldwide John Carter has already made its cost of filming back. Bizarre marketing may have sunk it in the USA, but the film has been enjoyed enough worldwide. One might contemplate how well it would have done if the supposed marketing budget had been spent on , y’know, marketing (including books/toys/posters/licensing). Alex, thanks for your comments. My sources for this blog entry included an article from the Associated Press about John Carter, as well as info from Box Office Mojo.Com that lists U.S. box office numbers. (My sources are listed at the end of each blog entry.) I couldn’t find anything that stated John Carter turned a profit overseas, though I wouldn’t be surprised. Hollywood blockbusters almost always seem to do well overseas. I guess you could say the Hollywood brand sells, even if the U.S. isn’t highly regarded throughout the world. Thanks for reading my blog and be sure to come again. New entries to my blog come out every Thursday. You can also follow me on Facebook (Just Movie Posters.Com) and Twitter (JMPosters). P.S. You are absolutely right about how the marketing budget should have been used on actual marketing.